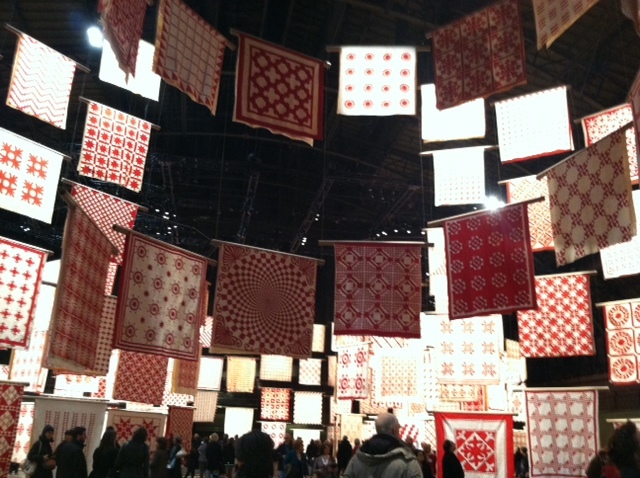 Today is the last day to see Infinite Variety: Three Centuries of Red & White Quilts at the Park Ave Armory. This short (6 days), free (yes, I said free) exhibit organized by the American Folk Art Museum features 650 red and white American quilts, all of which are on loan from the collection of Joanna S. Rose. It is the largest exhibition of quilts ever held in the city. We were there, with hundreds of others, over the weekend to check out the scene. It sea of red and white, from ceiling to floor, strikes you the moment you step through the door. Beyond the sheer amount of work on display, the variety and attention to detail that went into each and every piece is beyond impressive.